Seiryusan Kannonji Hojoin Temple might be the oldest temple in Urayasu built by the venerable Gangyo in 1196 in Kamakura Period. 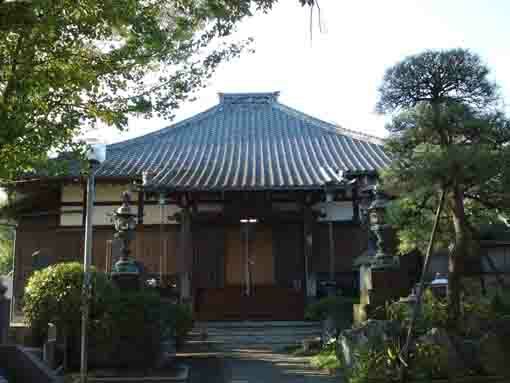 It is a branch temple of Zenyoji Temple in Koiwa in Edogawa-ku Tokyo and it is also belonging to Buzanha in Shingon Shu. Its principle image is Fudo Myouo. Moreover, there is a statue of Obinzurusama (Pindola bharadvaja) loved by villageres for a long time dedicated in the main hall and there is a Koshinto Tower designated as a prefectural cultural asset by Chiba prefecture on the right of the temple's gate. The Sango title 'Seiryusan' implies that Hojoin Temple was the Betoji (administrative temple) of Seiryu Jinja Shrine next to it in Edo Period. 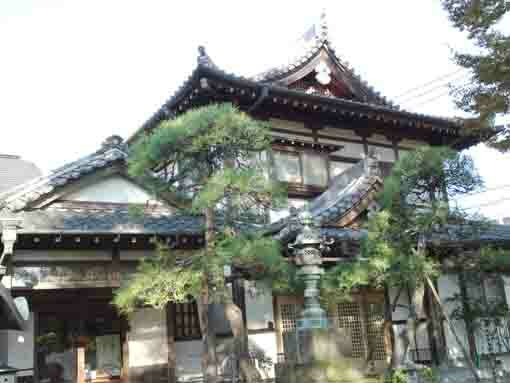 In addition, Seiryusan Kannonji Hojoji Temple is the 32nd temple of the 33 Pilgrimage in Urayasu and Gyotoku. Why don't you visit Seiryusan Kannonji Hojoin Temple? The Koshinto Tower of Hojoin was built in Descember 1736 by the chief priest Kenyu Hoin. The belief to Koshin is a religious belief based on Sanshi Setsu and Himachi (people assemble in a certain day and stay up all night long) of Taoism (a religious thought in Ancient China that aims to get perennial youth and long life and to get benefits in this world). Sanshi Setsu is a religious belief that an insect living in a human body called Sanshi gets out of the body to tell the god the sins done by the owner of the body in every Koshin Day in the sexagenary cycle (it rounds every 60 days), and the god takes some days from the life span of the owner. The supporters believing it assemble and stay up all night to avoid Sanshi getting out of their body. There are Kongo Bosatsu with blue face (Astottarasatabhujavajradhara) tramples on a devil and three monkeys of 'Mizaru (not see), Iwazaru (not say) and Kikazaru (not listen to) based on the Koshin that implies Monkey below the Bosatsu, two children and a pair of chickens on the both side of the Bosatsu and four demons on the lowest parts carving on the central part of the surface of the tower. This Koshinto Tower in Seiryusan Kannonji Hojoji Temple is less damaged, so it is a very precious historical one. In 1969, it was designated as a prefectural cultural property by Chiba prefecture. On the right side in the main hall Seiryusan Kannonji Hojoin Temple, a statue of Obinzurusama (Pindola bharadvaja) deeply believed by neighbors is dedicated. Binzuru (Pindola bharadvaja) is one of 16 disciples of Buddha. 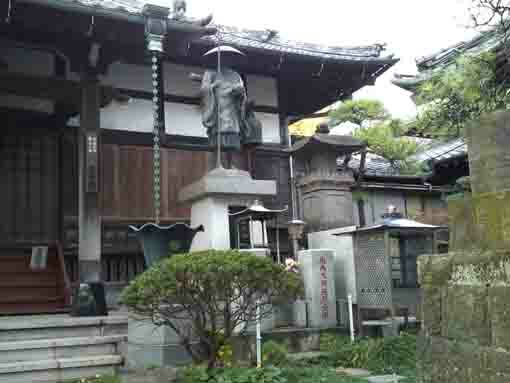 In Japan, the statue of Binzuru is generally set on the outside of the main hall (ordinally people pray at), and people suffering diseases stroke on the part of its body where they are affected the diseases on since they believe their diseases would be recovered when they rub it, so Binzuru is called 'Nade Botoke (Stroking Buddha)'. Obinzurusama in Hojoin Temple has a precious orb on his hand. some says that sometimes the believers have taken it to their house and they would return it when their wishes could be realized. According to the letters with ink on the back of its pedestal, the statue of Obinzurusama was carved by Jokei and Seihachi Nishiyama, sculptors of Buddhist image in 1824. And it is written on the back of Obinzurusama that it was fixed by Zenzo Okazaki in 1904. Seiryusan Kannonji Hojoin Temple has a great accessibility from both Narita and Haneda International Airport. From Narita International Airport, take JR Sobu-express line, transfer the line at Nishi-funabashi to Tozai line of Tokyo Metro bound to Nakano or Mitaka, get off Myoden Sta. And also take Keisei-line, transfer the line at Funabashi to Sobu-Local line, and transfer the line at Nishi-funabashi to Tozai line of Tokyo Metro bound to Nakano or Mitaka, get off Urayasu Sta. It takes minimally 60 minutes from Narita Airport. From Haneda International Airport, take Keikyu-line bound to Narita, transfer the line at Nihonbashi to Tozai line of Tokyo Metro bound to Nishifunabashi, Tsudanuma or Katsutadai, get off Urayasu Sta. From Tokyo (Otemachi) Sta, take Tozai line of Tokyo Metro bound to Nishi-funabashi, Tsudanuma or Katsutadai, get off Urayasu Sta. From Akihabara Sta, take Sobu line bound to Chiba, Tsudanuma or Nishi Funabashi, transfer the line at Nishifunabashi to Tozai line of Tokyo Metro, get off Urayasu Sta. 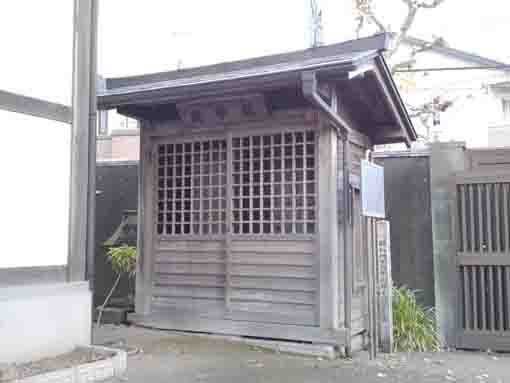 Take 5 minute walk from Urayasu Sta. * The location of the sixth temple is unknown, and the 16th and 17th are integrated, and the 18th is brought into the 19th temple. * Please ask some specific information in each temple.